BRANSON, Mo. 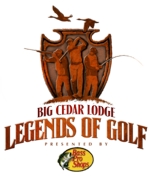 – The Big Cedar Lodge Legends of Golf Tournament receives the Most Outstanding Achievement Award by the Champions Tour. Elmquist says next year’s tournament will be played in April instead of June and expects ticket prices for the event to be announced next month.